I volunteered for 3 campaigns. Jason Crow, Tammy Story, and Faith Winter. It was awesome to see Jason throttle Coffman, Faith to win her Senate seat after the harrowing Lebsock debacle, and I was so happy to see Tim Neville lose by a lot. Took down the patriarch of the most deplorable family in Colorado politics. From up the mountain in Pine, I took particular pleasure in seeing Crow win, was not surprised (though I loved it) with Polis's victory, and rooted for Phil Weiser, though I thought his ads were a wee bit awful. And, to see Brauchler lose was the icing on the cake. And, in Pine, Park County, I took some little satisfaction that the GOP may be losing its hold up here with the 69% of the local vote coming from Democrats and Unafilliated voters. I'm psyched bout Jena Griswold's win for Secretary of State. We're seeing now, in Georgia, Kansas, other states, how having a corrupt secretary of state can impede democracy. Jena is so sharp, so competent and progressive that she will again make Colorado the state leading the nation on safe, secure, accountable elections. I think I’ve discovered Moddy’s spirit animal. Maybe Cliven Bundy has openings on his federal welfare agricultural enterprise? A cockroach can live a week without its head. Since Nutter likely lost his on Tuesday night let’s see hesdquarters gets him a new one by Wednesday. I’m imagining him sitting in a corner holding his breath until he turns blue. That, my friend, is poetic justice. I’m afraid the #DeadbeatDad House race may have been one bridge too far for the little feller. Maybe Judy Reyher can make a comeback bid. Is there any doubt he's already printed the bumper stickers for his #NeverBuentello campaign? that hate group, by the way, is in the infamous Westboro Baptist Church, a family cult that has a compound in west Topeka. By any chance, is that Native American lesbian the new representative for the members of that f—ked up family? Old Fred will be spinning in his grave if she is. That is beautiful and inspirational. Awesome, thank you for your amazing work, and getting to meet future Senators and House members…..keep up the energy and drive! I just saw Weiser's "Preoccupied" on YouTube and I thought it was cute. He does have a sweet, if cheesy and daddish, sense of humor. Cornholio has been a quiet, too. They have much to be modest about. The only time I saw Cornholio recently was during the Kavanaugh hearings. He only shows up to gloat anymore. So consider his absence a sign of good tidings for us. The last time I saw Cornholio we actually had a civil exchange about 122. Tom Sullivan! I cried when I read about his grief over losing his son, and I wanted only good things for him from there on. Wasn't expecting him to win in HD37, but was very happy to be surprised. Well, if Rhonda Fields could do it, with the same motivation, I didn't see why Sullivan wouldn't win; and he did. Most pleased by Crow, surprised and relieved by Weiser's win and 74's loss, and thrilled the Ds took the State Senate. Some progress is possible now. Griswold, for sure. In the year of the woman it would have been embarrassing to have our only woman on the statewide ticket, lose. That said, hats off to Morgan Carroll, too, on her first big win as Dem's Party Chair. If we're talking the year of the woman, we have to acknowledge that most of these wins wouldn't have happened without her leadership. Griswold over Williams was my favorite result by far. Our new SoS ran a superb campaign, overcame long odds, and got elected to an office that (other than Bernie Buescher's 2-year stint) has been in GOP hands since the early 1960s. Seems like only yesterday this very site was giving Griswold the business for adhering to the rules of professional conduct for attorneys. Nothing against Griswold, but Williams seemed like a competent SoS and ran clean elections. On the other hand, Stapleton, Brauchler, and Watson were complete grifters. the women who took back the state senate are my heroes. Well, between Williams' eagerness to send our voter info to Kobach, and his getting a little too comfortable with the perks of his job (cowboy boots, hat and jeans at taxpayer expense), I'm glad to have Griswold taking over and cleaning out all the cockroaches. Although, keeping Bartels as spokesperson would be an intriguing decision. It might be intriguing, as in wtf is she thinking? But Bartels is a Republican partisan to her core. Even some of her better angel decisions, like donating to Petersen, were probably more for damage control of her own party. I still question the need to inactivate 600,000+ voters. Even if they are technically still eligible to vote, a Democratic Sec State who actually cares about increasing voter participation would be more proactive in sending notice to cure inactivated status , closer to the upcoming election. A notice of inactivation two years ago (a month after the last election ) would be forgotten by most. But it’s a policy friendly to Republicans, who really don’t want everyone eligible to vote, since they tend to be voted out when that happens. And Bartels was the press spox to sugarcoat that voter inactivation policy, as well as Williams’ use of public funds for his cowboy costume, and for Williams unquestioningly handing voter data over to Kobachs voter purge operation. I think if Jena needs old hands to show her where the bodies are buried at State, there are plenty of career service nonpartisan employees. Um, they're supposedly inactive because notices bounced. Or at least that's how it's supposed to work. That is how it works, PR. But the notices to voters went out in December 2016, a month after that election, and not since. Bartels seemed unconcerned about Colorado's 600,370 "inactive" voters, and had no plan to communicate with these voters, other than publicly urging voters to check their registrations at govotecolorado.com. My point is that a more timely notice 6 months or earlier, before the upcoming election, like, "Wake up, voter! You moved and you need to re-register! Or no mail ballot for you!" through the forwardable snail mail, or DMV records whenever a vehicle is re-stickered, (we already implement that in Colorado) or just plain old research matching DOB and full names, would keep folks active and voting. 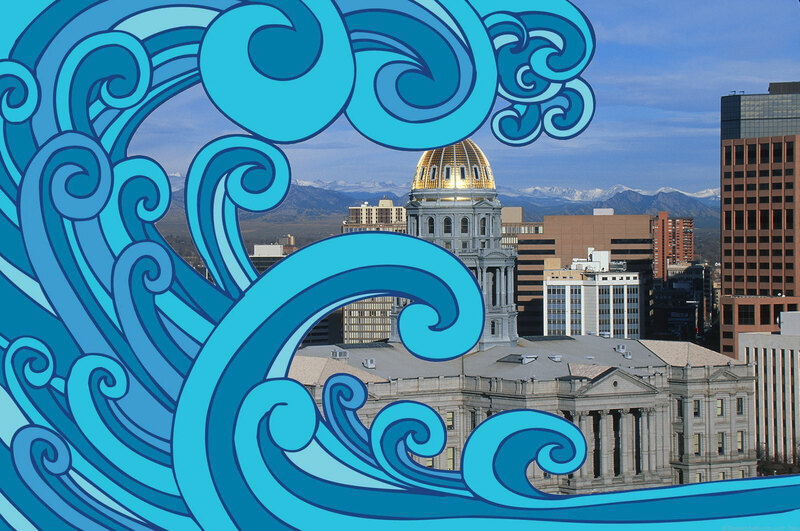 When mail ballot is the primary way people vote in Colorado, and it is, now, it is the job of the Secretary of State to promote mail ballot voting, in my opinion. National, portable voter registration would work, too, and is recommended by the Brennan Center for Justice. I expect Jena Griswold will be looking into portable registration and timely voter notice, and leading in these efforts. Because she is a progressive Democrat, she wants more people to vote. Wayne Williams did not, – he was content to go along with the Kobach Cross Check voter suppression efforts. Williams said that he "wasn't concerned" about what Kobach's Commission would do with the voter data. Lyn Bartels' merely marketed the election status quo as inevitable and helped Wayne to take credit for Colorado's hard-won (by Democrats) voter modernization and access law that created our great participation rates. I think PR's point was that the notices bounced, i.e., they weren't delivered. So how would mailing the notices 6 months before the election help? They still wouldn't reach the intended recipient. That's pretty much it. If it bounces, it's not going to magically get better. would give the voter one final chance to register if they are still in the state. Ballots aren't forwardable. Regular mail is forwardable if the recipient has changed their address. Voters whose mail ballots are returned as undeliverable are not inactivated until after the county closes the election in SCORE, our voter registration system, which occurs about 30 days after Election Day. They are still eligible to update their voter registration record and vote in the current election. If they do not do so, the law requires counties to inactivate their records after the election and send them a confirmation card advising them of that fact and how they can update their election. That post-election confirmation card is sent by forwardable mail. Voters in inactive status are still eligible to vote, but that status means their county clerk has a bad address for them, and they will not automatically be sent another mail ballot until they update their registration records. So voters get sent the "Oops, your mail came back" notice by regular mail 30 days after the election in which they didn't vote. Then nothing for two years, even though their address is presumably "good" now, since they're getting their mail again. I think that another, timelier notice of ability to cure the bad address and re-register makes sense – and I expect that Secretary Griswold will, too…..since she actually wants voters to vote. 600,000+ voters – most of whom moved within Colorado – are an awful lot of voters to "inactivate", i.e. prevent from voting the way most Coloradans do…by mail. This is not a partisan issue – I'm sure it affects all affiliations equally. Perhaps something a change in the law should effect; otherwise this is a county-by-county effort. I have no idea if Jena would even consider keeping Bartels around (or if Bartels would ask to keep her job). My comment was prompted by the respect Mike Littwin seems to have for her. The healing should start somewhere, and that position should be non-partisan. If Bartels isn't up for that, then sure, find someone that Jena knows and trusts to be her spox. Sure, but the fact that Williams managed to avoid big scandals and kept his theft of public funds relatively small-time only makes Griswold's win more impressive. Jason Crow’s trouncing of Coffman. Those of us in CD6 have suffered through so many losing campaigns it’s still hard to believe we finally won. It’s especially sweet to be part of the Dem House takeover that will apply some brakes to Trump. Tom Sullivan’s victory was also unexpected and icing on the cake. Seeing Faye ousted is one of my favorite political outcomes ever. and 5B, and Crow, and Story, and Leslie D, and seeing every Jeffco office up for a election where a Dem ran in won by that said Dem, and all our state offices, and and and and, it was a wonderful night night to be a Dem in Jeffco. I’ve got to agree with you about Griffin. She’s been at the public trough too long. Also thrilled to have Coffman out. I'm in Denver, so I didn't have to put up with him, but my mom did. She got spoiled having Perlmutter, who actually cares about his constituents. I think Crow will do a good job with constituent services. He has Perlmutter as a role model. Really pleased to see the West trending blue. Conservation issues matter. Finally, Texas political infrastructure changing for the better, thanks Beto! The Tim Neville loss is the sweetest for me. SD-16 wasn't used to being represented by someone that inflexible or extreme. We were used to sending leaders to the State Senate. "One of Colorado's closest races was finally decided Saturday afternoon as Republican candidate Vicky Pyne called Titone to congratulate Titone in the middle of her interview with FOX31. Brianna Titone is now the first openly transgender legislator in Colorado history." Dr. Yadira Caraveo – CO House 31. Is this the Dem who reclaimed that seat from Skinny Winkler?